Golden Globes hosts Tina Fey and Amy Poehler are determined to make sure viewers enjoy this year’s awards show – no matter how many meatball subs and cocktails it takes. It's fitting considering the Globes is known for being the liveliest awards show of the season. 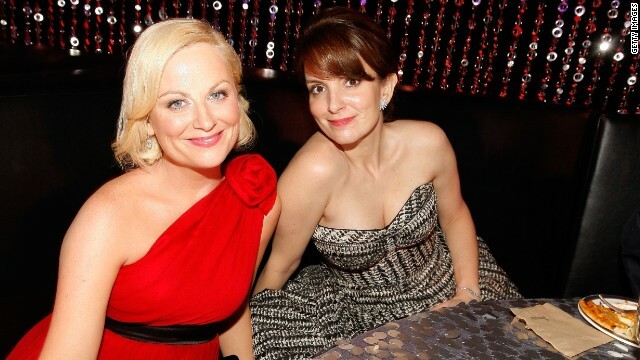 Fey and Poehler’s drinking game differs from the one “Bridesmaids” co-stars Kristen Wiig, Maya Rudolph and Melissa McCarthy proposed onstage at the 2012 Screen Actors Guild Awards: Drink any time someone says Martin Scorsese. But given “Boardwalk Empire’s” two nominations - for best drama and best actor - it couldn’t hurt to play both versions when the Globes air on Sunday, January 13, right? Thanks for every other wonderful article. Where else may just anybody get that kind of info in such an ideal method of writing? I have a presentation subsequent week, and I am at the search for such information. 2 good friends who are always together..
Tina and Amy are amazingly talented. Put them together and they are beyond hilarious. I pity those who cannot understand the nature/source of their humor. I'm looking forward to enjoying them for decades to come. poor tina she can't do anything right anymore can she. tell all. Actually she and Amy Poehler were really funny and did a great job hosting. Nice try, though. I'm guessing you are just a bitter Sarah Palin worshipper. poor tina she can't do anything right anymore can she – make sure everyone knows. thanks. tina fey needs way too much attention–out we go! do not discuss uuta night..thanks.. Lets get Lena Dunham to host next year. I want to drop a massive steaming poop into Amy Poehler's mouth. you could p her right now if you want.